Star Cinema’s latest movie offering ‘Kasal’ is a lesson on how to accept the imperfections of the one you love. In the age of popular cinema where viewers are caught choosing between teen fairytale romances or heavily problematic drama, a love story that is relatable but still refreshing to watch is a welcome respite. Set in the queen city of the south, Kasal uses Cebu city as a backdrop for what starts out as a typical love story between former high school classmates Lia (Bea Alonzo) and Philip (Paulo Avelino). Philip is the city’s most eligible bachelor and comes from a prominent political family while Lia works as a humble public school teacher who was raised by her grandmother. The progress of their romance is just like any budding relationship in which all signs point to a trip down the aisle except for one surprisingly big secret that reveals itself halfway through the film. Paulo and Bea first worked together in the 2014 teleserye Sana Bukas Pa Ang Kahapon and their onscreen chemistry is as strong as ever as they progress to become an engaged couple in the film. With their engagement coinciding with Philip’s bid to run as city mayor, Lia chooses to stand by her fiancé even when it means she has to work closely with her engineer ex-boyfriend Wado (Derek Ramsay) during his campaign period. Wado secretly plots to win back his former flame even at the risk of ruining lives in the process. Bea has long proven how adept she is at drama and her experience shows during her heavy dramatic scenes in Kasal. Her character Lia is a kind and broken soul who only learns how to truly value herself when it comes at a great cost. Paulo does not disappoint as he balances the role of a conflicted Philip who is a loving and sensitive fiancé as well as a idealistic political candidate who will do anything to gain his family’s approval. Derek slightly veers away from the clean-cut perfect guy mold to play a more gritty character here which results in him making each scene he is in even more exciting or dangerous, depending on how the audience wants to view his presence. 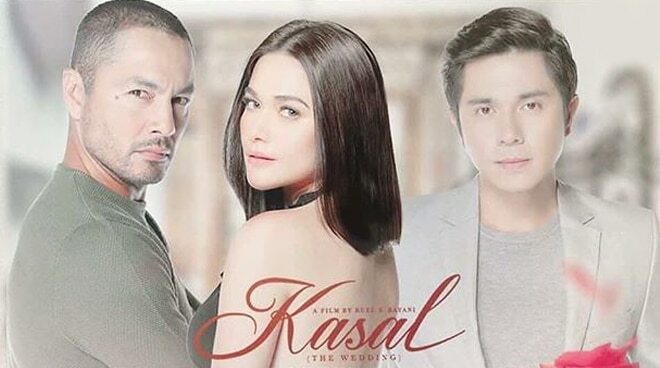 So out of all the movies about love out there, why is Kasal the one really worth watching right now? Because it’s not a story that claims to wow you with its idea of romance nor does it fantasize too much about finding the perfect love. Kasal is a story about three people who fell in love and shows how the experience changed, molded, and moved them forward in their lives. If there’s anything that Kasal really wants to teach its audience, it would probably be that people, no matter how deeply you know them, will always have a certain mystery to them. When it comes to love, the reasons why people choose to love and who they choose to love are purely their own and ultimately, that is what will define their life choices in the film.